This page includes EpicWrite.com reviews of users as well as an official review by ContentHeat in which we carefully analyze and write out our experience. 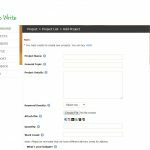 EpicWrite is famous for their simple, to the point service. Ever since this website started working in 2010 EpicWrite has been among the cheapest in this business. I had absolutely no experience with this website before, and I wanted to see for myself could something so cheap be any good. I have to admit their website didn’t really impress me. They are sporting a slightly outdated design, and they don’t offer a lot of information about the company itself. You can’t really learn much from their homepage, and they don’t have an About Us section, making the website seam dead. If you have any questions, you can use their Skype live chat. Any service that has live chat on their website gets an automatic plus from me since this is a sign that they might understand the value of a timely response to their customers. 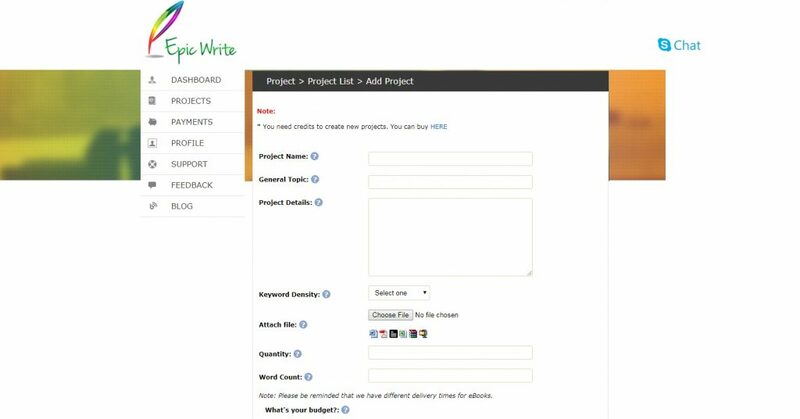 Unlike many other content writing services, EpicWrite has a simple user interface. 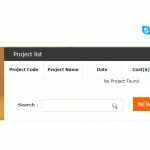 Once you buy credits via PayPal or Skrill, you can create a new project. Everything you need to tell your writer, you write there – name of the article, general topic, details, keyword density, quantity, and word count. You can also attach a file with instructions. Under that, you have a choice between their three packages – basic, premium and professional. 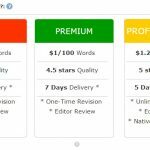 Basic (4-star quality) will cost $0.8 per 100 words, you get your article within 5 days, and you have the right to a one-time revision and an editor review. 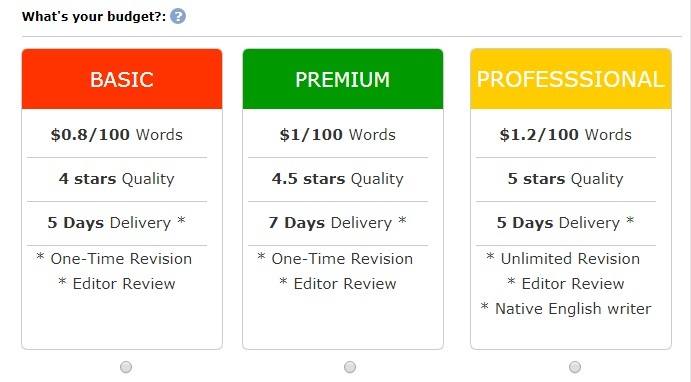 Premium (4.5-star quality) costs $1 per 100 words, you get your article within 7 days, and you have the right to a one-time revision and an editor review. Professional (5-star quality) costs $1.2 per 100 words, you get your article within 5 days, you have unlimited revisions and editor reviews, and, you get a native English writer. We chose the Professional quality – to be honest, I prefer English native writers, so that was my reason to choose their top quality offer. We asked for an article in the content writing niche. Nothing overly complicated, we gave them a task that we usually give to content writing services we review, and I expected their writers to be up to the task. This specific article didn’t require any in-depth research, and we provided a thorough explanation of what we expected. So, I thought that an average writer will be able to do it. With a price this low, I hardly expected premium quality, and, in spite of their advertising, I didn’t really hope to get a native writer. Well, I also shouldn’t have hoped to get my article within 5 days. Or 7 for that matter. No, my article arrived eleven days after I ordered it, earning this company the timewaster badge. There was no notification that the article is being late, which made me think this is a standard issue with EpicWrite. We asked for a 2500 word article, we received 2851 words, and the writer organized it according to our request. And then I started reading. After only a few sentences, I was able to tell that a native didn’t write this article. While some sentences were just fine, others read uncomfortably. As I said, I never expected a native writer to accompany content this cheap, but I did expect a near-native quality. After it was clearly stated in the order that the tone of this article had to be conversational and light, we got lengthy, tiring sentences. The tone of the entire piece was wrong, it read like a marketing manual. Hence, the hard of hearing badge. Grammatical and spelling errors were everywhere, and while the article is still readable, it isn’t what you expect when you order the very best service someone provides. Still, I can’t say that it’s all bad. Sure, they were incredibly late, the article was clearly written by someone who is not a great writer, but, this article was well researched, and organized according to our guidelines. On account of this, I reckon that their writer didn’t really ignore the guidelines, the problem was that he wasn’t up to the task. EpicWrite doesn’t offer high quality, but it offers really low prices, so their price/quality ratio is actually just fine. If you’re in search for cheap content, that is decently researched, and you’re not in a hurry, EpicWrite will be able to comply. So, if you want to pay the bare minimum, and you’re ready to do some rewriting of the material that you ordered – you can give them a chance.